The 2019 Calendar is ready - and it is forever EPIC! Welcome to the Corrupted Chronomancer Design Notes! 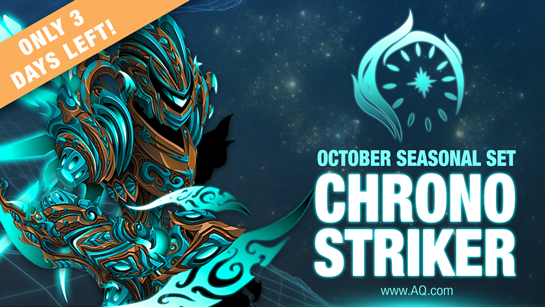 The design team -- after weeks of brainstorming, design, testing, and tweaking -- has outdone itself with the skill set for this new Chronomancer Class. With a crazy fun new mechanic and the potential to add in new updates in the future, for the first time ever, we are changing the course of space and time… and the rarity of the Calendar Class. 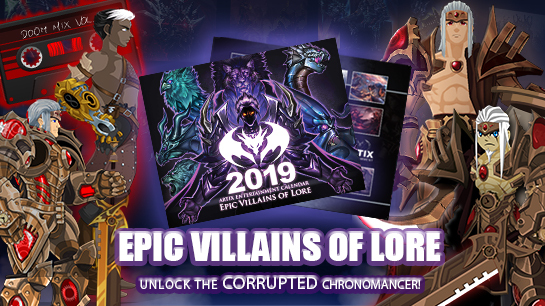 The Corrupted Chronomancer Class will return every year. This year, the base Corrupted Chronomancer Class is releasing. Next year, the Class will return plus a new item that (like the Hourglasses of Power, Paradise, and Transience) will affect the class’s gameplay. Head over to Heromart to get your first glimpse of the 2019 Calendar! We are trying something new again and have built a class around several unique class-only consumables*. There are 6 consumable items that act as a pseudo sixth skill you can use to customize the class to your needs. 3 of them are Hourglasses. Hourglasses provide a base to your class. They either flat out buff you in specific ways or provide complicated interactions. Then, there are 3 Corruptions. These corrupt your skills with different gameplay elements. You can prepare before a fight by equipping and using an Hourglass. Hourglasses last up to 2 hours (or until you log out or die). Then, switch to a Corruption to use during fights. The Hourglass aura will remain, meaning you can mix and match any one Hourglass with any one Corruption. Using a different Hourglass will remove all other Hourglass auras . Same goes for Corruption. You can only have one Hourglass and one Corruption on at a time. Also, did I mention this is all free and included with the class? You can also pick up a shop pet in the Book of Lore which will make it easy to top off your stacks of Hourglasses and Corruption. Description: Recommended Enhancements: Lucky, Hybrid. Corrupted Chronomancers rely on Hourglasses and Corruption they create using their Hourglass Pet (equip-able items found in the Book of Lore) to manipulate and distort time itself. Stats: Corrupted Chronomancers favor Strength, Dexterity and Intellect. ManaRegen: Corrupted Chronomancers gain mana from all hits landed in combat, and especially on critical hits. The amount depends on damage relative to *their own* HP total. Deals damage based on your weapon damage. Each of your skills gets an additional benefit from hourglasses and corruption you equip in your consumables slot. Hourglasses and corruption can be obtained from the Hourglass pet in the Book of Lore. Deals damage to your target and applies Temporal Rift to you. Temporal Rift stacks 4 times and is used by your other abilities. Reverses time to heal you. Heal is increased by stacks of Temporal Rift and consumes those stacks. Applies Corruption Through Time. Corruption Through Time increases all damage you do by 20% for 10 seconds. Doesn’t stack. Deals damage to your target based on the damage you've recently dealt while under the effects of Temporal Rift (in the past 10 seconds). Consumes Temporal Rift stacks. Starting from Rank 1, you can equip Hourglasses and Corruption as a consumable to enhance your other skills. [Corrupted Chronomancer Class]For the next 2hrs your Hourglass Inversion skill now also increases most of your secondary stats a further 10% for 30 seconds. Doesn’t stack. This includes Damage Done, Haste, Critical Chance, Critical Damage, Hit Chance, Dodge Chance and Damage Reduction. Note: This one is as straight forward as you can get. It’s a broad buff on everything you want. It doesn’t complicate things or add strategy. You just smash it and go. [Corrupted Chronomancer Class]For the next 2hrs, your Corruption Through Time skill now also toggles between several new buffs. You get a mana and heal over time, a reduction in damage taken by 60% and increased haste by 50%. Also, your crit chance and damage are reduced by 30%. These auras last 2hrs and toggle on and off each time you use Hourglass Inversion. Note: Mix this with an offensive Corruption to mitigate some of the Corruption’s defensive weakness. Turn Paradise off right before your nuke for great sustain AND damage! Note: This Hourglass lives up to its namesake- your life is quite temporary and chaotic. But, balance your resources, and you'll find it paying off handsomely. Get Ephemeral and you'll be dishing out huge damage while being nearly invincible- but your stay will be quite temporary. Stabilize yourself out and you'll act faster and gain health- but you'll lose your Temporal Rift stacks. Try to strike a balance alternating between these two skills, and you'll be able to extract the item's full power- but don't get too greedy! [Corrupted Chronomancer Class]For the next 30 seconds your Corrupted Sand Strike applies a DoT that stacks 15 times and lasts 40 seconds. Your Hourglass Inversion now applies a Heal over Time that lasts for 20 seconds and doesn’t stack. Note: Throwback to Infinity Knight/Chrono DragonKnight where DoT/HoTs were the highlight of Chrono classes. Provides great synergy if an Arachnomancer is being used to further increase their DoTs which Temporal Rift records for an even more powerful nuke. [Corrupted Chronomancer Class]For the next 30 seconds your Corruption Through Time skill now also reduces mana costs by 50% and increases Haste by 30% for 7 second. It also increases damage done by 100% for 4 seconds, and increases damage taken by 150% for 10 seconds. Finally, it gives up to 6 enemies Focus, forcing them to attack you for 3 seconds. 20 second cooldown. Note: This Corruption grants massive power boosts, but severely increases the amount of damage you take. In addition, Sand Rift starts applying Focus to monsters, forcing them to target you and making parties less of a safety net. You may have to combine this with a defensive Corruption or something like Archpaladin in order to get the rewards from this risky Corruption. [Corrupted Chronomancer Class]For the next 10s your Corruption Through Time skill now also applies Foresee for 150s. Using this hourglass while Foresee is active will consume it and apply Seer for 20s. Using Corruption Through Time while Seer is active removes it and applies Change the Future which applies Focus, reduces damage taken by 80%, increases Dodge Chance, Haste, Hit Chance, Critical Strike Damage, and Outgoing Damage by 100% for 5s. 40s cooldown. Note: This is the slow burn of Corruption in its slowest of slow forms. The damage boost is one of the highest in the game, the defense fits the cap and that’s not even half of what you get! Patience is power here. November is when the Fall season REALLY hits in the United States. Pumpkin Spice everything is in stores, the leaves have fallen (or are starting to) and the temperatures around the underground lab finally drop below 70 degrees Fahrenheit. This is harvest time in the Northern Hemisphere, and Thanksgiving in the United States, Canada, China, Germany, Grenada, Japan, and Norfolk Island. 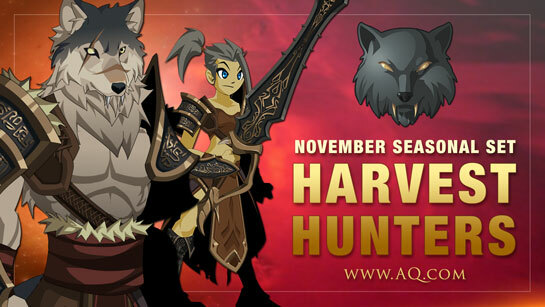 To help ALL our heroes celebrate, this month's seasonal set features the Harvest Hunters - the HeroHunter and Lycan Stalker armors. Starting this Thursday at 12:01 AM EST (that's server time), unlock the Hero Hunter or Lycan Stalker armors and all the Harvest Hunter accessories! 2) Individually: Buy each of the individual pieces from Garek the Traveling Gear Merchant in Battleon. The total cost to buy all of the gear individually is 4,000 ACs, so getting all the gear from the Harvest Hunters pack is a pretty sweet deal (you save 2,000 ACs). Each month, we'll feature a new set, available only during that month every year. December - August: ??? - come back to see what we'll bring! Is this the same as the monthly upgrade bonus? Monthly upgrade bonus gear is an extra reward for buying AdventureCoin or Membership packages. Seasonal set packs are bought separately. Just like the Flame Dragon Warrior pack, you can buy the entire set directly, for one price, on our site. You can ALSO buy the individual pieces in-game. This set will return EVERY November, so if you can't get it now, you'll have another chance in 2019, or 2020, or 2021, etc. If this isn't the monthly upgrade bonus, what IS the bonus in November? The next upgrade bonus will be available from November 2nd - 30th, and are the Apocalyptic DragonLord armors. What if I just want ONE of the items? You're in luck! Talk to Garek in Battleon. He'll be selling the individual pieces of the set through November 30th. Where do I get my gear if I buy the full set through the website? You'll find it in your Book of Lore. Every October, we celebrate the anniversary of AQWorlds' launch. This year -- our 10th anniversary -- we're showcasing a set that pays homage to the origin of your hero... and their future. AQWorlds was created when Galanoth the DragonSlayer killed the Eternal Dragon of Time* and the 3 original timelines** merged. The Eternal Dragon of Time rules over the past, present, and future. 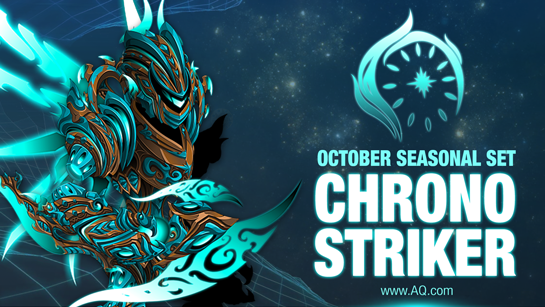 The ChronoStriker armor will enable you to strike at your enemies regardless of the timeline they inhabit. The total cost to buy all of the gear individually is 4,000 ACs, so getting all the gear from the ChronoStriker pack is a pretty sweet deal (you save 2,000 ACs). November - August: ??? - come back to see what we'll bring! This set will return EVERY October, so if you can't get it now, you'll have another chance in 2019, or 2020, or 2021, etc. If this isn't the monthly upgrade bonus, what IS the bonus in October? The current upgrade bonuses are the Guardian of Time sets. These brave warriors defend the timestreams from those who would corrupt them, or use them for their own nefarious purposes. Get more details here. You're in luck! Talk to Garek in Battleon. He'll be selling the individual pieces of the set through October 31st. * To see this in-game, /join thespan and play through the 10th Chaos Lord's story, Iadoa the Chronomancer. Your hero may experience deja vu upon seeing the Eternal Dragon of Time. It is perfectly normal. Do not be alarmed. ** Based on the first three Artix Entertainment games, AdventureQuest, DragonFable, and MechQuest. Kalestri Hound in /void has been put back in the kennel to let the Void Bear back to it’s spot. Prismatic Doomknight Helm had some CC tweaks to match it to the Enchanted Sepulchure Armor. Brightoak Avenger Armor had multiple colour and shading updates. Shadowscythe General heel is farther down than usual. This is due to the leg being longer than the standard template. Bloodless Hair does not have a transparent piece, it has a gap in the strands of hair. Time Assassin having black feet is the way Laken sent the art in. Our Mogloween 2018 Event Starts Now! You are invited to the opening of Twig's Pizza-and-Arcade Palace! Our Halloween (aka Mogloween) celebration continues this weekend with a completely-safe, totally not-scary, parody-laden event full of animatronic amusement. Just be aware.. the characters do tend to wander a bit. Don't hold it against them. Starting tonight, /join twigsarcade and prepare for a helm-raising party with some of your favorite friends! You can also find the rare, Ebil Animatronic set in the Featured Gear Shop until November 9th. 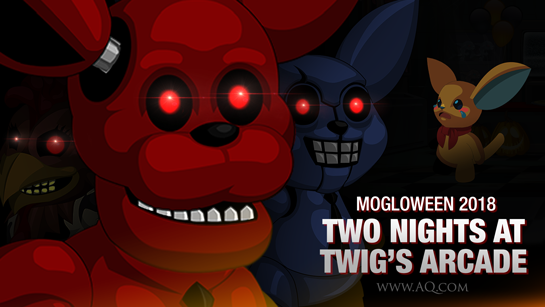 This year's Mogloween event was inspired by AQW Community Artist, Yo_Lae, sent us a crazy-awesome series of animatronic moglin armors and pets inspired by another horror game franchise, Five Nights at Freddy's. Here at the Secret Underground Lab, there are some preeeeetty big FNAF fans, so when we saw Lae's art, we were immediately sold. If you have played AdventureQuest Worlds for at least 8 years, you can unlock the NostalgiaQuest zone by purchasing the 8th Birthday Candle for 0 ACs from your Achievement Tracker badge shop. We've added a handful of new weapons to Yulgar's Dual Wield Shop. This year's Achievement Tracker rewards are still in progress. As we talked about here, each achievement will unlock an armor set and an exclusive class variant to farm for from a unique mini-adventure zone. Next week, we'll add the armor sets to the badge shops. The classes and zones are finished, we will add those, as well. Read on to get the news you need to know as the team pushes on towards tomorrow's update. Older Fortune Tickets: If you have older Fortune Tickets (left from 2014), Captain Rhubarb is working on the direct ticket exchange now, and has good news! He will be able to swap your old tickets for new ones, so you can use them right away. Those will start rolling out shortly. Free Wheel Spins: Testers and coders are hard at working confirming the FIX for the exploit preventing the return of free spins. They will be back as soon as humanly (or robotically) possible. Missing Treasure Potions / XP Boosts: If you don't see your TP/XPs, check your bank. They are not missing! This was the solution for every account that has reported the issue so far. Next week, LightCaster and LightMage Classes will become available year-round. Yorumi and Arklen are working on the HOT/DOT visual display issue. If you are reporting bugs to the Bug Tracker (and please do... it helps the team fix them faster! ), make sure you use your confirmed email address. Due to security issues, the Bugs team can only communicate with the registered email address attached to your game account. If you need assistance with updating your email address please use this link: "How to Change Your Email Address"
Spin Swaggy's wheel to get prizes! Five years ago, we launched the Wheels of Doom and Destiny from the Carnival of Fortune. 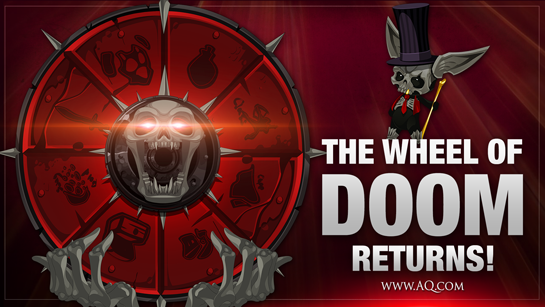 They were one of AQWorlds' most popular features and starting today... the Wheel of Doom is BACK! /join Doom and talk to Swaggy to buy Fortune Tickets, then spin the wheel and get prizes. Use the Treasure Potions and the XP Boosts in combat or in the Wheel of Doom Merge Shop. 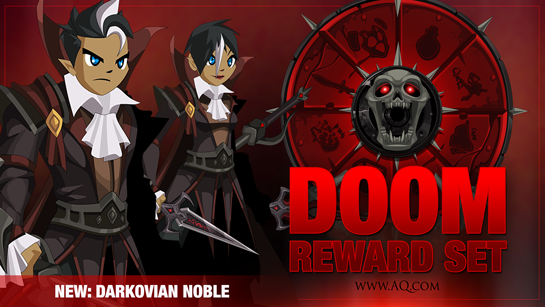 To celebrate the Wheel of Doom's return, we've added all-new sets: the Darkovian Noble and the Sanguine Shield. The Darkovian Noble is available from the Wheel of Doom. The Sanguine Shield set pieces drop from the Wheel of Doom or you can spend your Treasure Potions in the Doom Merge shop to unlock them. Check out Swaggy's Prize Preview Shop to see what the Wheel has a chance to drop. That's also where you can check the item rarity, which determines an item's drop rate. You can tell what an item's drop rate is by checking its item rarity in the description. If you are only seeing the Treasure Potions and EXP Boost rewards when you spin, that means you have gotten a LOT of the high-drop rate bonus prizes already or you are having a bad run of real-life luck! 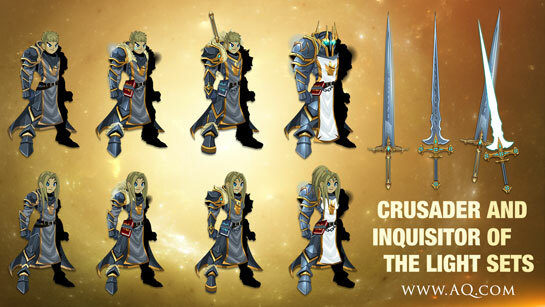 Read more about drop rates in AQWorlds here. Exclusive items will be available for a limited time only on holidays and special occasions. These will have higher-than-normal drop rate. You will only be able to get the Epic Item of Donated Awesomeness one time; it cannot be sold or deleted. Legendary items will be available in the Wheel of Doom for a few months, then will be rotated in and out to make room for other items. More items will be regularly added to the Wheel of Doom, so keep an eye out for new gear. Bonus Prize items cannot be traded or swapped; getting the prize you want takes real life luck! If you get very lucky, you may just get an Epic Item of Donated Awesomeness from the Wheel of Doom! If you see that in your inventory, follow the directions in the item description to contact the AQW team and choose a rare item you would like to receive! If you have the EIoDA, once you contact the team, we'll review your request. Should we need an account from a Donation Hero, we will contact them before removing an item to confirm their decision. Because we have to do this by hand, we cannot do this for every player. The only way to move items from one account to another is if you receive the Epic Item of Donated Awesomeness from the Wheel of Doom. This is the ONLY way Rare items will EVER return to the game. What about the Ultimate Item of Donated Awesomeness? Back in 2013 and 2014, the original incarnation of the Wheel of Doom included the Ultimate Item of Donated Awesomeness. With the Wheel's return for the AQWorlds 10th Anniversary, the UIoDA has been replaced by the Epic Item of Donated Awesomeness. If you were lucky enough to get the Ultimate Item in the past, you will still be able to get the Epic Item now. Each time you spin the Wheel of Doom, you'll get a Treasure Potion. These can be used to boost your Strength stat OR in the Wheel of Doom Merge Shop. Save up your Treasure Potions and spend them in the Merge Shop to unlock extra reward items. We didn't plan for ANY of Quibble's items to go rare... EVER... but many of you love your rare items, so we will return "Unknown/Unassigned" Quibble items to the Wheel of Doom and Destiny, but ONLY those items...ever! Items marked "RARE" are perma-rare and no more of them will ever be added to the game for all players again. *It is possible to receive a Rare item from someone else in the game, but ONLY if you receive an Epic Item of Donated Awesomeness drop. That item is only going to one player; not being re-released to all players. Cycling "Unknown" rarity items in and out! Every few months, the "Unknown rarity" items will change out to keep their quantity in-game low. Check the Wheel regularly to see which items are currently on the reward list! The week before the items are scheduled to cycle out, the drop rate will be raised from 1% to 2% to give everyone one last chance to get them before they become unavailable for a time. 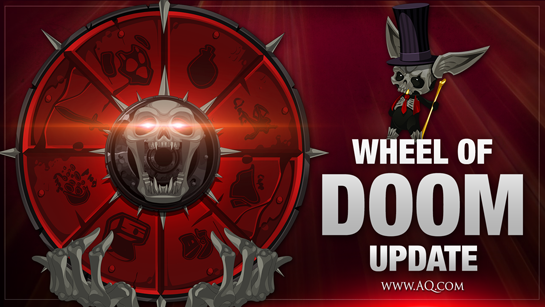 All of this information and more is included in our Wheel of Doom FAQ (Frequently Asked Questions). Check it out here. Shadowscythe General (AC version) items have been given their damage bonus now. Reki has left the (Brightfall) building. 0AC version of Ghostly Naval Commander missing art has been re-arted. Sepulchure’s Original Helm horn straightened and toothpicks removed. Prismatic Doomknight Helm eyes are now eye coloured. 10th Anniversary Nulgath Pet no longer changes color when laughing. Elegant Kimono female arm has been sewn back on. Renn's Wear eyebrows on male were not missing, they had been bleached out. They’ve been re-coloured now so they show. Tank Mech Armor female art now showing. An issue which has been popping up a bit more often now is something we thought we had locked down, and that is the error message “You do not meet the requirements …”. We had initially thought this was a cache issue, as clearing cache did fix it 100% of the time. We were partially right. Turns out the issue stems from stackable items and how they are handled. When you pick up stackable items, they are first placed in an empty space in your inventory and then move to the stack they should be in. This happens so fast that you normally should not even notice it happening. But how does this cause the “You do not meet the requirements …” error you ask. And that is a great question. What is actually happening is when you pick up the item and it moves, it reserves that space for a few seconds, or longer if it’s even the least bit laggy. The server is reading the space as occupied even though it is not. When all of your inventory is filled with these ghost occupied spaces, it gives you this error message. This also seems to happen, if a bit less often, when you are buying items from a shop and banking them or selling them to get them in your BuyBack Shop to make room to buy more items. Even more rarely, it may also happen with quest items. You can stop and clear your cache if you wish. Or just relog. Or just wait a few moments. In most cases, this will actually resolve itself within a few moments. If it does not resolve itself within 2 minutes, a relog will solve it. If a relog does not solve it, then something else broke and we will need you to send a bug report! ***This Extras post brought to you by the Wheel of Doom testing! Master of Moglins Class and ShadowScythe General Buffs! Welcome our newest class to the mix and get excited about some ShadowScythe General buffs! These changes were made in response to player feedback. The class now plays significantly simpler. You no longer have to wait through your cycles to get the buffs you want and get them right away. You can also get all 4 at once and oftentimes do. You also now hit 4 targets with your skills. For these reasons we had to reduce the power level on other parts of the class, notably, on hit damage and Luck. These changes have been added to the design notes below. Thank you to everyone who contributed to the Moglin kickstarter! 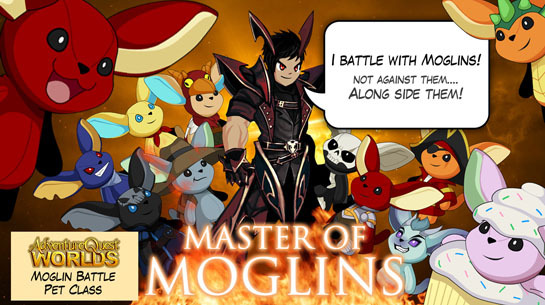 We are mega-moglin proud to announce the release of the Master of Moglins AQW battlepet class! Fight alongside your favorite moglin friends to take down good, evil and anything in between! Your 1 skill will summon Twilly to fight alongside you and your 4 skill will attack with all 10 Kickstarter moglins! We found that ShadowScythe General was very close to the power level we wanted. We didn't want it to push out other, harder to get, classes (particularly farming classes). We made some small adjustments based on your feedback. Also, we noticed a few players struggled to defeat ShadowScythe General as Void Highlords. We found Void Highlord will always win if they're patient with their skills. Don't kill yourself spamming those self harming skills! Anyways, thanks to everyone who tested out the class, we read all the feedback and appreciated all help. Your test ShadowScythe General classes should all now be Warrior skins. Now, onto Master of Moglins! Concept: You battle alongside moglins and call them to your aide. This is a well rounded jack-of-all-trades/buff/support class. Your skills target 4 enemies (or friends) and have long range. Due to the limiting way this class was made available, we didn't want to make it the go-to for anything. We opted, instead, for a fun, easy to use class that can be used for a variety of things. Description: Recommended Enhancement: Wizard. Thank you for your contribution to the 2018 Moglin Kickstarter! You have earned your place as a Master of Moglins and can now call on them to assist you and your allies in battle! Stats: Masters of Moglins favor Intellect and Wisdom. ManaRegen: Master of Moglins gain mana from all hits landed in combat, and especially on critical hits. The amount depends on damage relative to *their own* HP total. Auto Attack - Moglin's Magical Strike: Deals between 10% of spell power as damage to your target. Rank 1 - Moglin Life: Your Moglins heal you! Heals you and up to 4 allies on hit. Then Twilly buffs Endurance. If it's already buffed, Twig heals health over time. If that's already buffed, Cupcake heals mana over time! If used out of combat, while you don't already have a pet equipped, will summon Twilly! Buffs lasts 30 seconds, don’t stack and don't refresh. Rank 2 - Moglin Spirit: You burst with Moglin spirit! Deals damage to up to 4 targets and applies Pirate +20% Haste to you. If you already have Pirate, you get Frogzard. If you already have Frogzard you get Quibble, then Paladin and finally Dricken. Buffs lasts 30 seconds and don't stack. Rank 3- Moglin Menace: Has a chance to randomly apply up to 4 different evil Moglin Auras for each hostile target. Zorbak DoT to your enemy (lasts 20 seconds and doesn't stack), Legion 5% Damage Buff to you (lasts 20 seconds stacks to 6), Mort 7% Dodge Buff to you (lasts 20 seconds and stacks to 6) and Memet 10% Crit Chance Buff to you (lasts 20 seconds and doesn't stack). Rank 5 - Moglins Frenzy! : Damages and debuffs based on your buffs! This final skill applies a different debuff to your enemy for each buff you have on yourself! For example, if you have Twilly +20% Endurance from your Moglin Life skill, you'll apply Twilly -20% Damage to your enemy. Our 10th Anniversary WAR begins tonight! 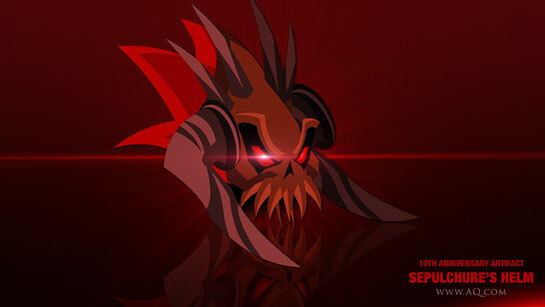 We continue our 10th anniversary celebration with Chapter 2.2 of Sepulchure's Saga. Last week, you battled as Sepulchure the DoomLord and fought to create the beast that would become ShadowFall... your flying Dracolich Fortress. But Light will NEVER let Darkness flourish in our world... that's why Paladins exist! This weekend, gear up and head into battle as Sepulchure and fight off the 500,00 LightGuard Paladins and Citadel Crusaders who want to destroy you. As you fight to raise the war meter, you'll unlock additional quests and merge shop resources. Turn in the war quests for a chance to get the pieces of the Apprentice of the Light armor set. Use the merge shop resources to evolve your items into new forms! These sets were crafted for Heroes of the Light (or heroes who just like looking GOOD) by legendary AQW Community Artist, Zee the Legend. Take on the war boss for exclusive drops and to farm all the merge shop resources. Then, talk to Noxus for a bonus battle once you've defeated the boss! /Join birthday and take on the Chocolate Cake to get Renn and Zio's armors. We asked them to stand in Battleontown, but they much preferred hanging out near the sweets. The Chocolate Cake also drops the 10th Birthday Hats of Wonder, Joy, Bliss, and Delight. 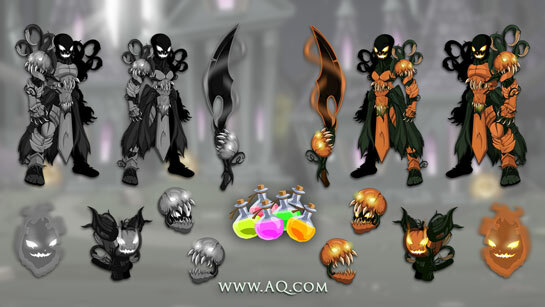 Upholder Accessories: The 10th Upholder SpiderKin Star Series and 9th Upholder Vampire Star Series (Staff, Daggers, Polearm, Scythe, BackBlades, and Reversed BackBlades) will be added to Dragon Road next Friday. 2018 Achievement Tracker Update: work on the Achievement Tracker zones is still in progress. We will keep you up to date and will begin previewing rewards soon. Five years ago, we launched the Wheels of Doom and Destiny - one of the game's most popular features, where you can buy Tickets to spin the wheel and get prizes. Every spin rewards you with gold, a Treasure Potion to spend in the Wheel of Doom merge shop and a chance to get a bonus equippable item. 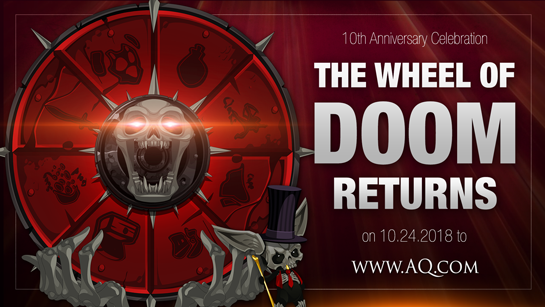 The Wheel of Doom returns next week as we continue our month-long 10th anniversary celebration! Each spin rewards you with at least $1 worth of in-game content. This includes: 10,000 gold, an EXP Boost, a Treasure Potion, plus a chance for an Awesome, Epic, Legendary, or Artifact bonus item. Treasure Potions can be used in the Wheel of Doom merge shop to unlock additional gear. EXP boosts can be traded in the merge shop for other boosts. Each time you spin the Wheel of Doom, in addition to the gold, EXP boost, and Treasure Potion you receive, you'll have a chance to get a bonus prize. These equippable items include Doom versions of some of the game's earliest "Unassigned" rarity items and many items created exclusively for the Wheel. We'll continue adding new sets to the Wheel of Doom's reward table and merge shop in the coming months. The Epic Item of Donated Awesomeness will drop from the Wheel of Doom. With this item, you can write in to Player Support and claim items harvested mostly from deleted and abandoned accounts - and sometimes by your fellow generous heroes. If you get this item from the Wheel of Doom, you can write in to Player Support and request almost any item in the game*. If one is available, they will add it to your account. we'll look at returning the free daily spins for members and free monthly spins for all players. Stack Spins have been removed to better help all our heroes monitor their Wheel spin activity. * The Wheel of Doom will return permanently, barring any unforeseen fires, floods, Flash exploits, or codestorms that rock the digital world. Earlier this month, we had hordes of players asking for the Wheel of Doom to come back, to help celebrate our 10th anniversary. We know that many of our players joined after the Wheel was removed, and we felt your pain. Based on the investigations and fixes we did back in 2014, it didn't look like a return would be possible until AQW:Mobile, and that's what we announced earlier this month. "What do we need to do to bring back the Wheel of Doom back this year?" The answer they gave after early investigation was... "The exploit still exists. We MUST FIX THE EXPLOIT!" The next logical question was, "What do we need to do, make, or find for you to move forward?" Yorumi took a break from working with Warlic on AQW:Mobile and did a deep dive back into the game's engine. When he came out (covered in binary bits and code shavings) his answer was... "We can make this happen." And so, to celebrate our 10th anniversary (and ALL the requests from players over the years for this functionality to return...), we are bringing back the Wheel of Doom! Our 10th Anniversary Class is here! We are celebrating the AQWorlds 10th anniversary with a class full of DOOOOOOOOOM! 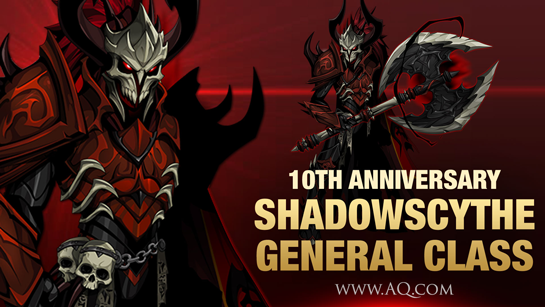 Starting tonight, log in immediately unlock the ShadowScythe General Class for 2,000 AdventureCoins or begin the fight to unlock it. Legends can earn the merge items 2x faster! Both versions of the Class and gear will be permanently available. The AC versions of the armor, helms, cape, and weapon will have additional damage boosts. Last week, members got a chance to preview the class early and give us feedback on its skills and balance. We appreciate their help, and they'll be able to keep the armor art as our way of saying "Thanks!" We built this class with a focus on group PvP. It’s a niche we haven’t really focused on much and we wanted the Paladin-crushing General to be an absolute boss in group PvP. In fact, your Undead Rebirth straight up prevents Paladins (and LightCasters) from getting or giving several of their auras! Outside of PvP we also wanted it to hold its own as a farming class and we gave it some of the best sustain out there. Description: Recommended Enhancements: Lucky, Hybrid. By the powers of of Noxus, you have been reborn as an Undead General! Paladins, Lightcasters and even High Lords tremble at your dark presence. Gather your undead army and take what is rightfully yours! Mana Regen: ShadowScythe Generals don't use mana. They gain power from submitting their defenses to Consuming Shadows. Deals damage on hit and grants a stack of Consuming Shadows which which debuffs your damage resistance by 4% and increases the damage done on all of your skills for 20 seconds. Stacks to 20. Also applies Overwhelming Shadows to your target, reducing their haste and damage by 10% for 2 seconds. Disperse the shadows in a blast of dark energy. Deals damage to up to 6 targets and has a 50% chance to petrify them for 1 second. Applies 3 stacks of Consuming Shadows per target hit. You also gain Rush of Unlife which increases your haste by 40% for 8 seconds. Rips the bones right out of your enemies! Deals damage to up to 6 targets and applies a stack of Consuming Shadows. Also applies a stack of Undead Assembly which increases your damage done and healing done by 10%. Undead Assembly lasts 15 seconds and stacks to 4. You rebuild yourself. Applies a HoT that lasts 4 seconds. Your undeath creates an aura of decay around you preventing up to 6 hostile targets from healing for 4 seconds. Applies a Shadow Seal on you and your enemies which blocks your enemies from applying the following auras: Illuminated, Lumen, Light Wave, Soul Drinking, Abolish, Righteous Seal and Blinding Light. Shadow Seals lasts 10 seconds. Increases damage resistance to a max of 80% and prevents 10% of damage resistance debuffs. Explode in a void of darkness. Deals massive damage to your primary target and less damage to up to 5 surrounding targets. Damage is increased by Consuming Shadows stacks and consumes those stacks. Damage always crits and can't miss. Also applies Crippling Fear to all enemies hit, decreasing their dodge and hit chance by 30% for 3 seconds. Twilly’s Platinum Dragon Friend description updated. Paragon’s/Nation’s Dragon Wings quest descriptions have been updated. The button in /orecavern that was supposed to take you to /ancienttemple actually takes you there now. Projectionist Top Hat missing the brain part - this one was really weird! The missing bit was only if you had finished past a certain quest, which is why it was so hard to track down. It is now fixed! Ghostly/Forgotten Navals Male secondary/extra belt has been unbelted. Eternal Champion’s Wings have stopped changing colours. Xiang’s Evil/Dual/Good Wings no longer turn 90 degrees when you move. This isn’t really a not-fixed, but I’ll list it here anyway. The Evolved Lightcaster has always been unselleable during Aranx’s birthday event. It will be sellable again tomorrow. Update for heroes experiencing the "Unknown Error Accessing Game Database. Please Try Again Later." issue: Captain Rhubarb is investigating the problem and we will resolve this as soon as possible. I apologize for the inconvenience. We will keep you updated here and in the DNs. Update #1: Captain Rhubarb, Cemaros, and the Bug Hunters are on the hunt. They will report in ASAP. 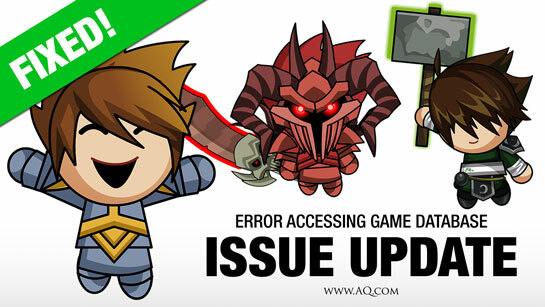 Update #2: The issue (which only affected select AQWorlds member accounts) has been resolved! Thanks to those who reported the issue; we've left a gift on your account to show our appreciation for helping us fix this very nasty issue. 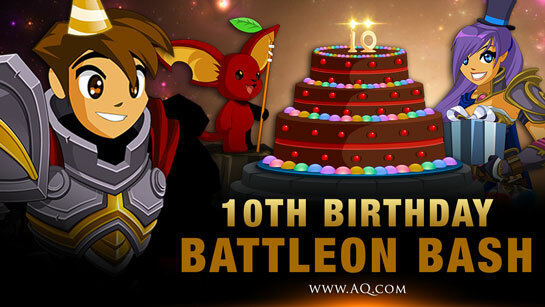 The Battleon 10th Birthday Bash begins on Friday, October 12th! Welcome to your AQWorlds' 10th Anniversary party, Hero, and thank you for battleon alongside us! No matter if you've been with us since 2008, or just created your account yesterday, this party is for you because... without your enthusiasm, support, loyalty, and encouragement, we would not be here. 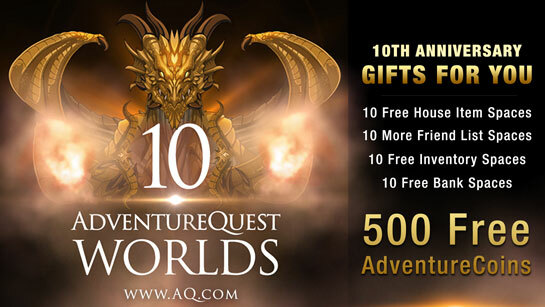 Log in NOW as we begin the first week of AdventureQuest Worlds' BIGGEST anniversary celebration ever. Head to Battleontown to /party with all your favorite NPCs and friends from across our game universe. 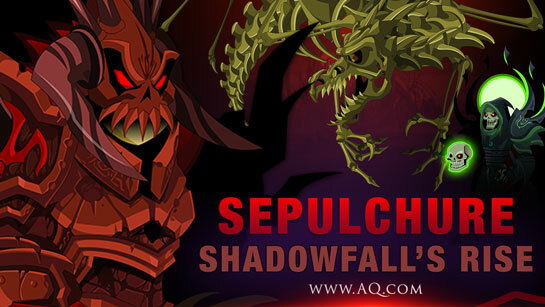 With 4 maps, 21 quests, 11 shops, 5 cutscenes, and over 60 items, this week's DOUBLE 10th Anniversary Birthday/Sepulchure's Saga release is HUGE! Talk to Zorbak in Battleon to quest for 12 new Good and Evil house statues! Explore Battleontown and see who's come to your party... like The Hollow, Tomix, Verylrus, and more! Each NPC has words of congratulations, shops, or quests for you to take. Plus, each of the Game Leads' NPCs has their BattleCon shop featuring imported gear from their games PLUS a new item just for you! Our Gifts to You: Free ACs and More Space! Yesterday, we gave all eligible heroes 500 free AdventureCoins and more inventory and bank space as our way of saying thanks! for playing AdventureQuest Worlds during our 10 year anniversary. Check out the 10th Anniversary Rewards shop, with the seasonal Eternal Champion set and the event rare Platinum Eternal Champion sets! 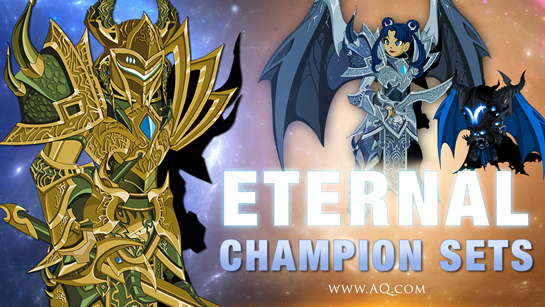 The Eternal Champion's Paragon and Nulgaht pets each have a quest for equippable versions of their wings, to help you and your companion sync up on and off the battlefield! Each pet has a quest for an equippable version of its helm. 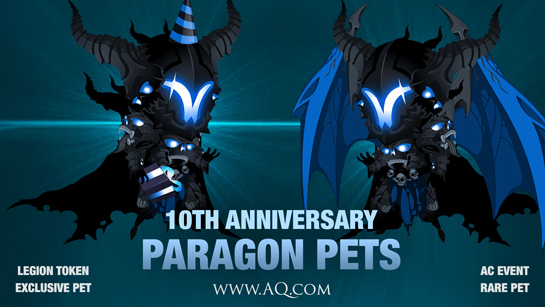 The 10th Anniversary Paragon and Nulgath pets will be available until the end of the year. If you're only just now joining these factions, you will have several months to farm for the requirements to unlock the pets! Happy battling! 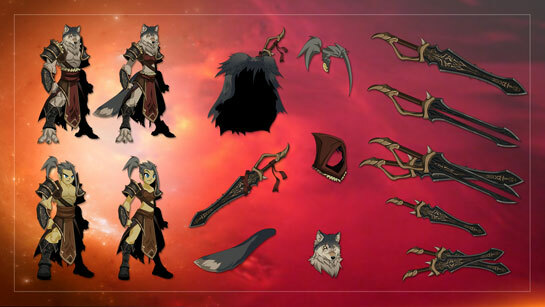 Starting tonight, members can talk to Gravelyn in Battleon to try out the ShadowScythe General Class. This baby has some lore behind it (he was originally a LightGuard General who... sadly... fell to Sepulchure and Noxus) and a LOT of power. Next week, you'll be able to unlock the class immediately for 2,000 AdventureCoins or - much like the Artifact Hunter Class - you'll be able to farm a daily quest and/or get drops from next week's boss. Note: the color custom helm will arrive next Friday. 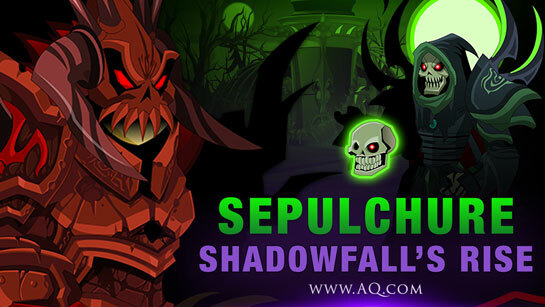 We continue Sepulchure's Saga with Chapter 2... the Rise of ShadowFall! This section of the story follows Sepulchure as he battles to build a foundation for himself. Noxus the Lich is very willing to use (and abuse) his desire to expand. This week, fight through /noxustower as Sepulchure on your way to become the darkest ruler Lore has ever seen! Our 10th anniversary event is really a double event. There's the full birthday release, but with such an milestone year, we wanted to tell a story that none of our games ever has. ShadowFall has been such a HUGE - but silent - part of your adventures through Lore that showing its creation felt like a worthy story to tell. Next week, we'll continue the tale as the Champion of Light (and Sepulchure's love) Lynaria re-enters the picture on HER quest to save him from the Darkness. 2018 Founder Pet: Twilly's Platinum Dragon! Tonight: the original AQWorlds Founders will unlock their exclusive 10th Anniversary Exclusive pet: Twilly's Platinum Dragon! This is our way of continuing to say "thank you!" to the original supporters of AdventureQuest Worlds. For the last several years, we themed the Platinum Dragon on one of the Talk Like a Pirate Day naval sets, and this year was going to be no different. We tried the "Ghostly Platinum Dragon" and the "Golden Platinum Dragon" AND the "Spiderkin Platinum Dragon" but... none of them felt QUITE right for such a milestone. So we went back to our roots, and your heroes. Twilly has been with you for the last ten years, and its fitting he join your platinum dragon now. This week is only the FIRST part of our 10 year anniversary extravaganza! 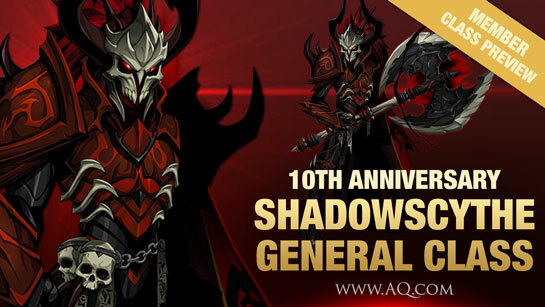 Next week: the ShadowScythe General Class will be available for all players. Buy it for ACs or farm for it (daily quest or boss drop methods). NostalgiaQuest will have a small update. The Color-Custom Sepulchure Helm and Renn/Zio armors will also be added. You make our games possible, and for that Artix, the AE team, and I /salute you! Here’s to another 10 years and more battling to save this world and all the future ones we journey through together. Sepulchure's Helm is one of the most iconic items in AdventureQuest Worlds. For the past 10 years, we've gotten requests from players on our forum, on social media, in-game, and via email, asking for a way to obtain this helm. This Friday, you'll get FOUR different ways to obtain it! Instead, we created a what we call a "Sane Completionist" end-game gift. Unlocking Sepulchure's Helm is a badge of honor; a way to show everyone that you've finished everything we consider "main story content." If you've kept up to date with all the releases, or bought one of the HeroMart products listed above,** we want you to be able to log in and immediately unlock the helm once it's live. This Friday, find Gravelyn in Battleontown as we celebrate our 10th anniversary with the BattleOn Birthday Bash! Once the birthday event is over, the quest for Sepulchure's helm will move to ShadowFall. *Sepulchure's DoomKnight armor and random RNG drops not required. Tricks, Treats, and Sweet Rewards are Back! 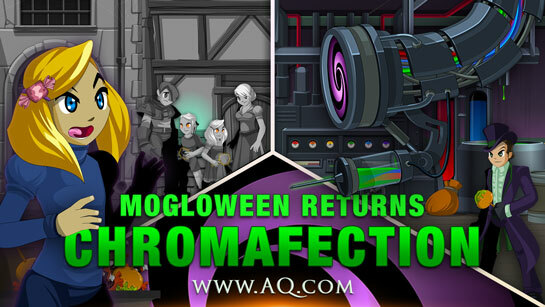 Log in this weekend and return to the haunted town of MystCroft as all our seasonal Mogloween zones, bosses, and rewards return, plus taste the PAINbow in an all-new adventure chock-full of colorful confection-based mayhem in /chromafection! The Chromafection: When a mysterious benefactor sends Wacky Winka (the owner of the Snackers Candy Shoppe) a sweet new confection-creation machine, a delicious-but-deadly new threat is unleashed. Help Carly Canister save her family and friends from the color-sucking candy zombies, then battle the Chromafection itself to colorize your rewards. His quest will drop the dyes you'll use in his Chroma merge shop to create the full Pumpking armor set! 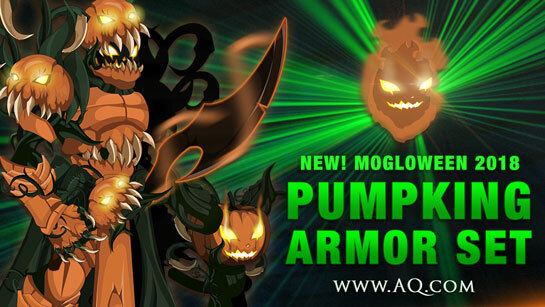 The Colorless Pumpking moglin pet is 0 AC, and available for all heroes. Members can dye the Colorless Moglin pet to create the Pumpking Moglin pet. Getting a Head(less) Start on Halloween! If you haven't joined us for this event before, Mogloween is the fall seasonal event where you Trick or BEAT your way through the spookiest, creepiest releases we've put out over the last ten years! Spookiest Gear of the Year Returns Friday! 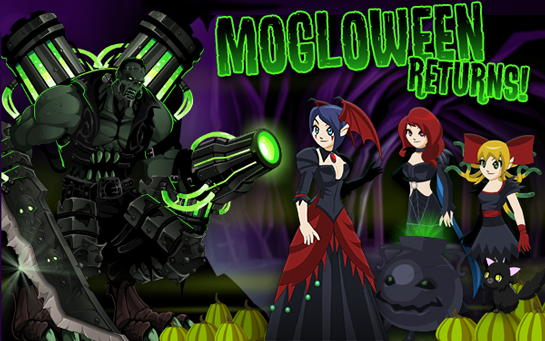 Find the Cauldron sisters, Bubble, Toil, and Trouble, when you /join mogloween and help them play their tricks to save Mogloween... and all the delicious treats that come with it! You'll also have a chance to unlock some of our most awesomely spooky (and most popular gear) of the year, plus new farmable rewards including the 0 AC Shadow Jester set shown below! Talk Like a Pirate Day Rares leave Monday! This is your last weekend to pick up any of Quibble Coinbiter's 2018 Talk Like a Pirate Day items, including the Pirate King Treasure Chest. They will leave Monday, October 8th, so get them while you still can! Naval Commander and Dragon Shinobi Buffs! This week we have two class buffs for you. The (delayed) Naval Commander and Dragon Shinobi. Read on for more details about the changes to each class in the full Design Notes post here. Todayy is National Taco Day. This holiday celebrates everything taco and all of it's many varried forms. Find all of these crunchy costume equips in your Featured Gear Shop in hte game menu. The items will be available until October 11th. 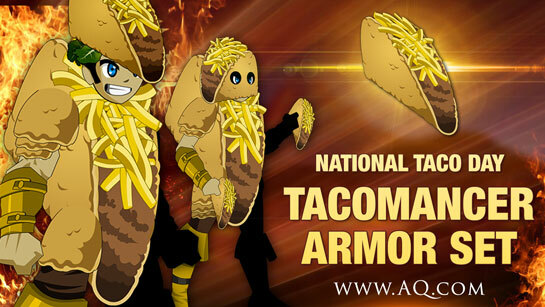 This is the only time you'll be able to get the absolutely delicious tacomancer armor (and the rest of the taco seasonal rares) until next year! September Seasonal Shop items are now tagged Seasonal instead of Rare. Akiba and Yokai River maps have now stopped celebrating the Star Festival. “Interruption” cutscene in /manor had a few minor fixes: weapon not loading and some CC issues. Golden Commander’s Back Cutlass (sword) renamed to Golden Commander’s Cutlass. Meta Sneevil moved back out ya bidness. Dragonkoiz exit arrow is now in shiny silver instead of glorious gold. Ghostly Naval Commander chin sticking out below other helms. See Non-Standard Set Items please. Skeletal things do this as a way to cover the actual head. Mace of the Blessed Inquisitor not having glowy bits is intentional. It’s the Blessed Inquisitor’s power which makes the glow. The Hero does not have that power. Not all items in a release are going to be AC tagged. This is not a bug when they are not. Hey Folks! Once again, we are still getting a royal ton of reports which are all solvable by clearing your cache. There has even been a reminder put on the Bug Tracker report page to clear your cache. We're really serious when we say we can't fix this for you. This is something only you can do. So please, CLEAR YOUR CACHE before reporting a bug.